The 26th March 2019, we woke at 6 am jumped in the car and headed out on the second leg of our podcast roadshow! We headed South on the M1 for 127 miles, until we reached our destination… Dress Me Pretty Bridal Room in Hinckley, near Leicester. The shop is a lovely boutique style bridal shop, which has an amazing array of wedding dresses, perfect for a bride who is looking for something that little bit different. The shop is run by the owner Amy Mann, who agreed to chat with us on the podcast. We wanted her views on what to look for when sourcing your wedding dress. Obviously both Dominic and I, being male, and never having had any experience wearing or buying dresses in the past!! Which I hope comes as no surprise!! We thought that it would be better to get the opinion of Amy who has a great deal of knowledge as this is her area of expertise. We chatted to Amy and asked her what her shop offers brides. They stock the dresses the Bridesmaids and also shoes and wedding accessories. 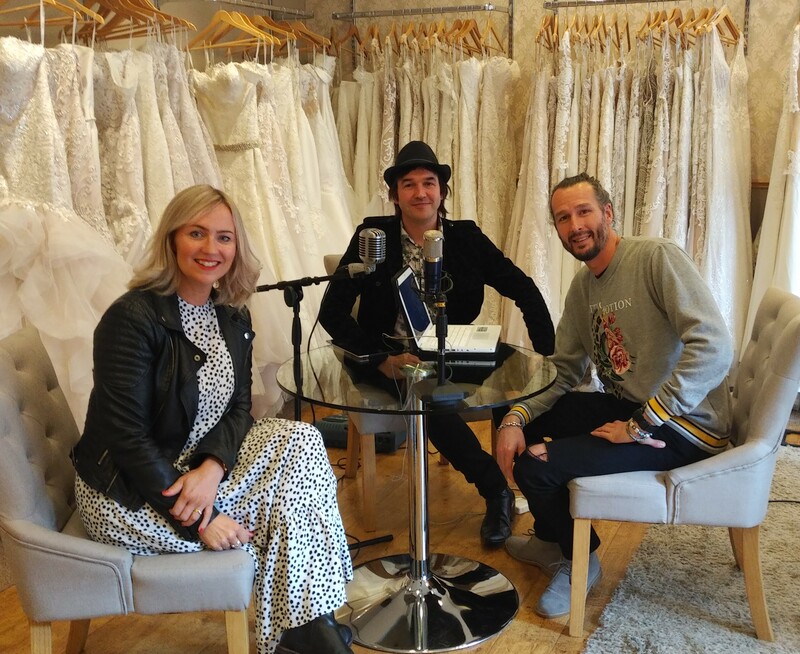 She told us about how to book an appointment at the shop and why it’s a great idea to book an appointment so that the bride to be can really take their time and decide on the perfect dress. Given the choice of wedding dresses out there and also the emphasis put on brides to look good on the wedding day, we can only imagine that this could be rather a daunting process for many bride and grooms. We also asked her about how she got involved in bridal retail and also what the future held for Dress Me Pretty. They are opening a new ship next door, this is their third shop which shows that the company really is expanding. 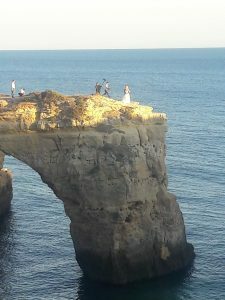 Word spreads quickly in the modern age and many bride-to-be’s will travel to the shop from London and also from the coast. 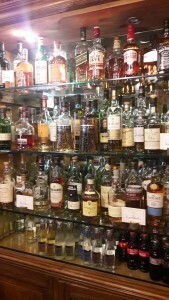 This really ins testimont to the shop and also what it has to offer. We would like to thank Amy for her advice on the podcast and also congratulate her on having such a thriving business. Amy pictured with Dominic and Kieran, during the recording of the podcast. 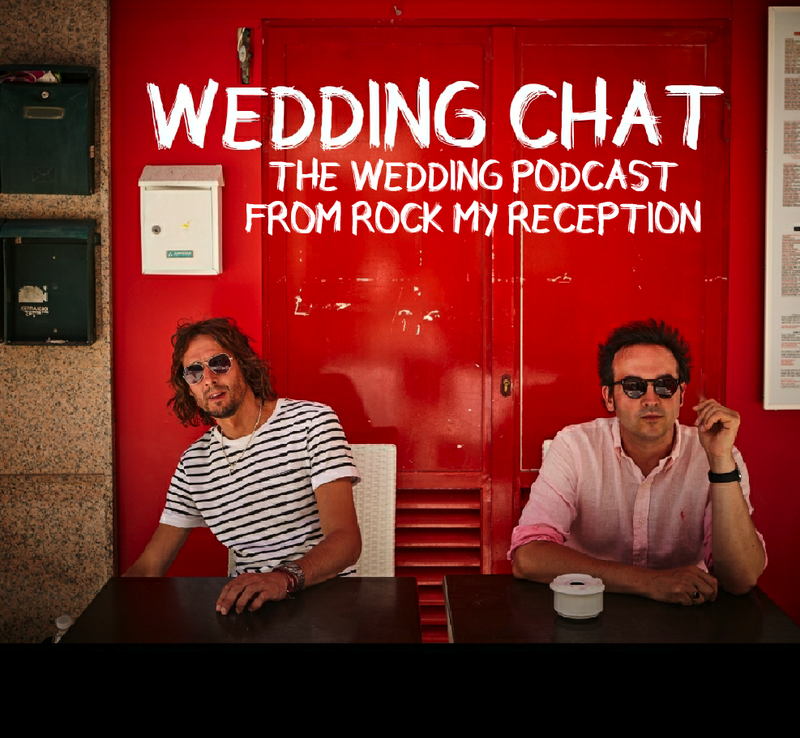 We always wanted our podcast to be as interesting as possible, for any wedding couples who are looking for that little bit of alternative information to help with their wedding planning. Below we have the blog which runs along side each individual episode. 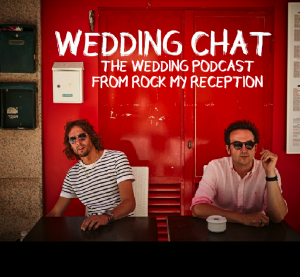 Rock My Reception are regulars in Dubrovnik, Croatia, as wedding singers and musicians. They pride themselves in offering live wedding music for UK and Irish wedding couples who are planning on marrying in the Dubrovnik Old Town or the surrounding areas like Cavtat and Babin Kuk. Rock My Reception have a range of packages to include live music at any point during your wedding day, from the ceremony, drinks reception, boat cruises, wedding breakfast, and the evening and night party. Sun, sea and serenading through Portugal with a Ukulele-Rock My Reception are invited to play wedding reception at international footballer Luis Figo’s hotel near party capital of Albufeira. For any musician being hired to perform at a wedding: it’s a big gig. It’s a day the couple have probably been planning for 2 years and will one of the most important days of their married life. So, with this in mind it’s vital that all i’s are dotted, t’s crossed and every eventuality is covered and Rock My Reception know all about preparation. How long before the wedding was it that Emma and Dean chose Rock My Reception as their wedding band? Talking of equipment needed, what instruments and amplification do you both take out to a destination wedding? With a stunning view overlooking the Mediterranean Sea. Emma and Dean had decided upon having a 3pm wedding ceremony. 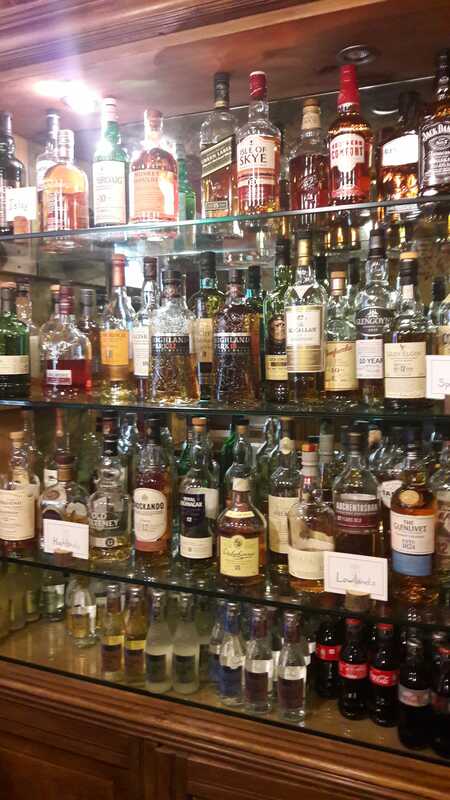 This has the advantage of giving the bride, groom and guests all time to prepare themselves for the occasion. It also prevents people from peaking too soon when faced with a day of much eating and drinking! Rock My Reception had chatted with Sandra with regards to their positioning during the ceremony and had liaised with Charlie from Kaleidosonix who provided all equipment for their evening set. 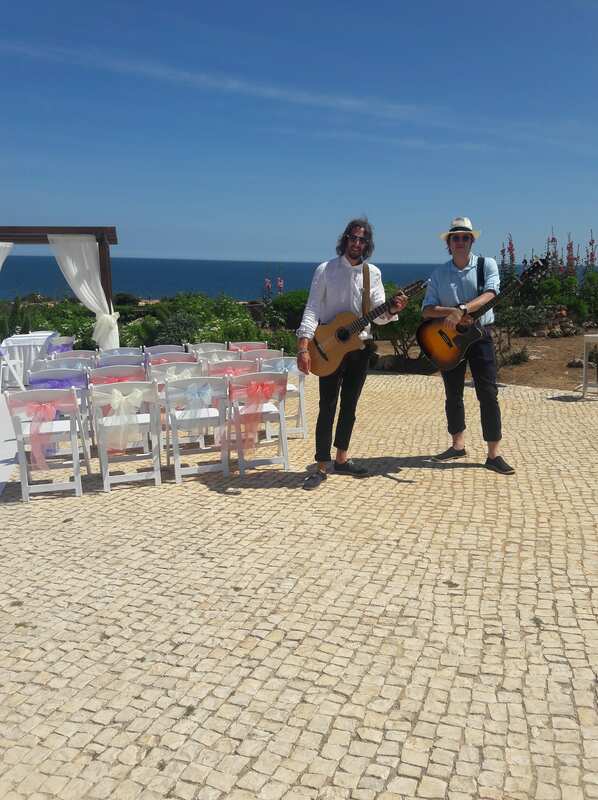 After the ceremony, which was conducted in both Portuguese and English, Rock My Reception played for the guests taking requests throughout the drinks reception. 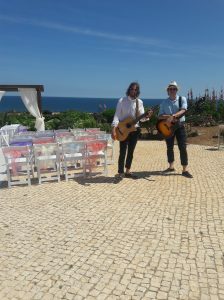 Rock My Reception playing a cover of the Ben E King classic Stand By Me in Portugal. The evening had a very bespoke quality to it! Kieran and Dom would like to thank all the staff at Suites Alba Resort, Sandra from Sonho a Dois Algarve the pa hire company Kaleidosonix for all their invaluable help and last but not least Dean and Emma for hiring their services on what was a wonderful destination wedding. It’s a Wednesday in early October 2017 and we’ve just returned from an incredible and original wedding location, The Lodge in Argyllshire, Scotland. 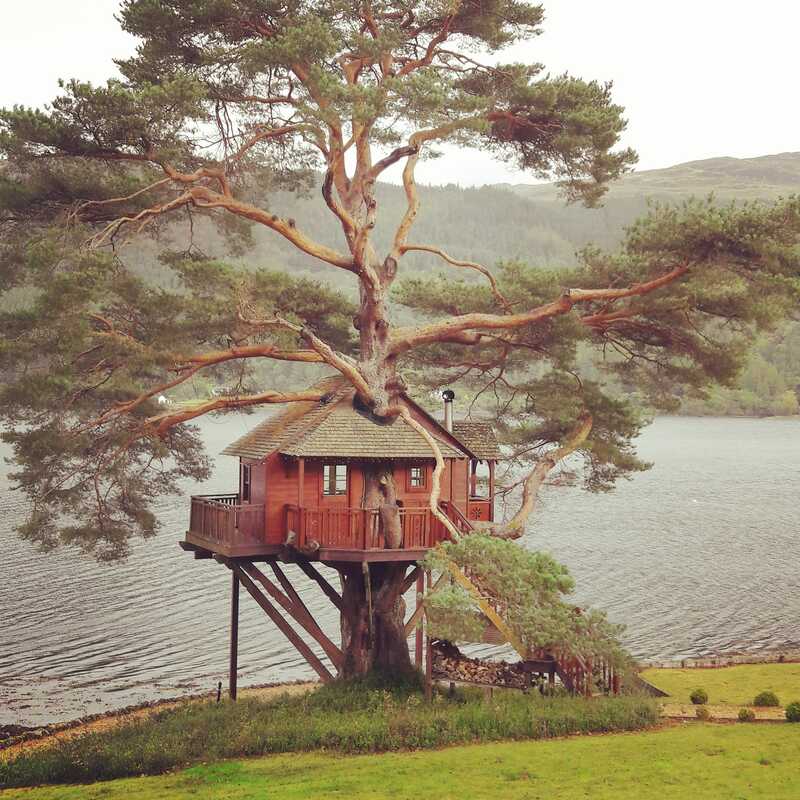 A scenically perfect venue sporting exceptional late 19th Century architecture, an outstanding vista of Loch Goil and the venues focal point: a treehouse which is guaranteed to take the breath away! The happy couple, Lisa and Gordon had liased with us, deciding on choosing the perfect songs for their ceremony. One of the benefits of being flexible with our set-list, is being given songs to learn which we’ve never heard of before. This was the case with Marty Mones’ ‘Better Than A Dream’. Mone is an Irish country singer and was chosen by Gordon. A real upbeat song where the lyrics were particularly pertinent to the bride and groom. The ceremony entrance song was Jack Johnsons ‘Better Together’ as the bride and groom entered the ceremony hand in hand, in front of all the guests. Gordon and Lisa then made their way to sign the register in the tree house, as we serenaded them on ukuleles playing ‘It Must Be Love’. The setting couldn’t have been more perfect. As we made our way to the Arts and Crafts room for the drinks reception, the name given to the room for the unique pre Rennie Mackintosh decor. The walls share the same hand painted wall paper with only one other room in the world, that is the library in The House Of Commons. During the drinks reception we were given many song requests by the guests. Lisa and Gordon had invited 26 guests in total: an ideal number for such an intimate setting. With the roar of the coal fire and the rich dark oak and classical chic of the venue, the atmosphere was almost like a Christmas party! We made our way to the venues different rooms so as to include all guests in our requests: we certainly like to keep mobile and provide a troubadour element to our performance! The Lodge has, without question, one of the most friendliest and efficient wedding organising teams we have ever had the pleasure of working with. From start to finish, the team headed by Alice were attentive to all the guests needs, made the day run effortlessly and were responsible for the joyous atmosphere throughout the day. 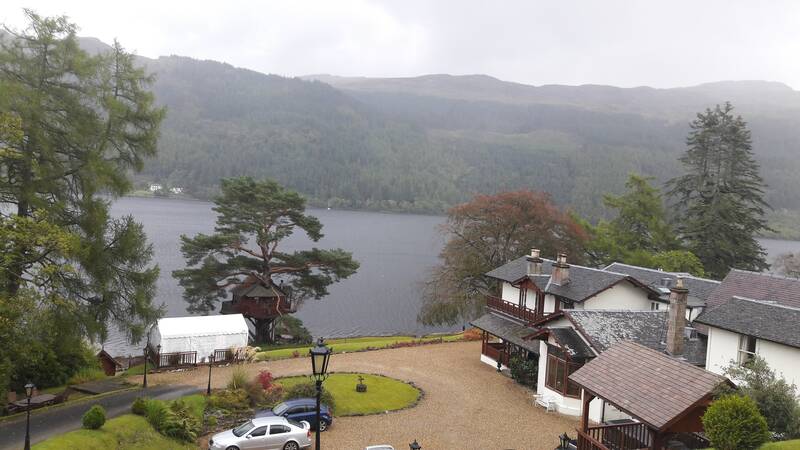 It is easy to see why they are inundated with enquiries for wedding’s at the The Lodge. Every part of the day ran smoothly, stress free and the food served at the wedding breakfast could easily have been of a five star Michelin standard. After the wedding breakfast during the room turnover, we offer a ukulele set… a laid back, informal, unplugged, sing-a-long, where guests are more than welcome to join in! We decided this would work perfectly at The Lodge, it is always fun to have some interaction with the wedding guests and take requests on the spot! At dusk, the tree house was a perfect backdrop for our weekly feature on our Instagram page for #ukuleletuesday. So we recorded a ukulele version of Scottish singer/songwriter Paulo Nuttini’s Pencil Full Of Lead. Click HERE for the link to our Insta page to see the video. As we took it up a gear after our post breakfast ukulele set for the evening function, guests joined in with Lisa and Gordon on the dance floor for the contemporary classic first dance song, ‘All Of Me’ by John Legend. After that it was a case of anything goes, where Motown classics and hits all across the decades kept all the guests dancing right up until midnight, with a repeat performance of Marty Mones ‘Better Than a Dream’, concluding with The Proclaimers’ 500 Miles: well it was Scotland after all! We wish to thank Alice, Iain and all the staff at The Lodge for making us feel so welcome and their wonderful hospitality. This is certainly a standout premiere wedding venue and we hope to join the team again soon. We would also like to thank Lisa and Gordon for asking us to play at their wedding. It was a huge honour to play for them both and their guests and furthermore, as the wedding season for 2017 comes to a close it was a wonderful way to begin to bookend a hugely enjoyable year. One of the great joys of being a wedding singer is turning up at a brand new venue you’ve never set foot in before, knowing for the next 12 hours this beautiful setting will be your place of work. This was certainly the case when in August 2017 we arrived at Angrove Park in North Yorkshire to perform at the blessing and wedding celebration of Dan and Claire. As we made our way through the picturesque village of Stokesley and approached the venue we were greeted by the great expanse of the Cleveland Hills and North Yorkshire Moors. With ominous clouds on their retreat, exposing clear blue skies and with this stunning backdrop we knew already that this was to be a country wedding where people could relax and enjoy the British summer at its finest. Upon arrival we were greeted by Louise and the team at Angrove Park who helpfully showed us where each part of the day would be taking place. The park itself is a genius idea all round-a camping cabin site for people who don’t do canvas, yet want to experience life in the outdoors. The near luxury venue includes exceptional facilities and complete with tepee, doubles as the ideal outdoor bespoke wedding venue. 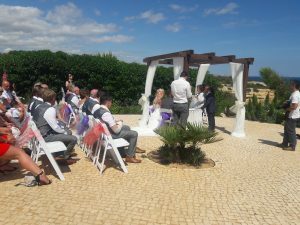 Only a few weeks ago we had been playing a destination wedding ceremony in the baking heat of Marbella, Spain and on our return to England it had seemed as though summer was well and truly behind us. Today however, we were all to be treated to the last throes of sunshine and daylight the year had to offer-and used it to our advantage. Having already had their official wedding day the day previous, the ceremony saw the happy couple receive a blessing of their marriage with guests and ourselves gathered at the top of the field with the full panorama of the Cleveland Hills surrounding us. Piles of shaved twisted logs were arranged in a neat semi circle to resemble a rustic setting to carry out the ceremony. Outdoor weddings are a gift to Rock My Reception as we get the freedom to bring our acoustic mobility to the fore. As Claire and her bridesmaids made their way up the luscious makeshift green aisle and we played Snow Patrols’ Chasing Cars, there were less nerves than usual as the couple had got all the formalities of the official ceremony out of the way yesterday for real. As the brief blessing came to a close, Dan was permitted to ‘snog his bride’! The couple then made their way back down the aisle to the strains of our acoustic rendition of Dakota by the Stereophonics. Throughout the day we performed outside of the tepee around the bar area where guests were seated and would hand us request cards with a wide range of requests from The Clash to The Wonderstuff, Joe Brown to Bruno Mars. We certainly endeavor to bring variety to all wedding receptions and try our best to bring something to the table for everyone! After being kindly invited to join Claire, Dan and their guests for the wedding breakfast we then made our way back outside for our post meal ukulele set. The ukulele is an instrument that is really capturing people’s imagination at the moment and already we’ve had feedback from wedding couples saying that guests have taken up the uke after seeing us perform at their wedding. It’s portable, dainty-even quite humorous and with its four strings and tiny neck, is a much less daunting for a beginner than a guitar. Indeed Dan’s Uncle Michael explained to us how he’d transformed his electric guitar into an electric ukulele by removing two of the strings and raising the nut. He then joined us for a Joe Brown sing along with Brown’s 1962 hit Picture Of You. We even got the opportunity to play Divine Comedy’s National Express on the Angrove Park’s Double Decker bus, now being used as a bar! British weather can always be hit and miss so we always try to make the most of good weather should we be blessed by it. One of the ways in which we can utilise this, especially in cases of outdoor weddings, is to suggest having the first dance unplugged outside as not only does it give the occasion a festival atmosphere, but also lends itself beautifully for the perfect romantic photo of the couple dancing with the expansive picturesque scenery in the background. Dan had suggested an acoustic version of Bryan Adams’ Heaven. A joy to play and got everybody singing and joining in dancing with Dan and Claire. We also posed for photo’s perched on the logs with Dan and Claire kissing and playing our ukes as the sun went down! One of Angrove Parks other hidden gems is the ability to be able to see the stars at night in the North Yorkshire skies, untainted by light pollution. Our evening DJ set was a pleasure to play and Dan’s sister made sure the guests were dancing all night with her Queen requests! Sadly, all good things must come to an end and for the nights close we ensured everyone was still dancing around Dan and Claire for the couples last dance. What a magnificent day it had been: a superbly run venue in which Louise and her team organised the proceeding to perfection without a hint of stress and a ensured a relaxed and friendly atmosphere at all times, yet the whole team being attentive and on the ball at all times. It was a real joy to play for Dan and Claire, not to mention all their wonderful guests and we wish them both luck and happiness for their future together.